Photos by Ian Thomas (left) and Julian Heavyside. The semipalmated plover is a small shore bird with fairly distinctive colouring. It has a brown back and white underside, a brown head with a white face, and a single dark breast band. There is usually a small white spot behind each eye, though this may not be present on a breeding male. The bill is small, and orange with a black tip. The partial webbing between its toes gives this bird its 'semipalmated' name. Click here to hear the semipalmated plover's call. This species is usually found on sandy beaches, lakeshores, and mudflats during migration season. It can often be seen scurrying along the shoreline searching for prey. It tends to nest on pebbly beaches far above the high water mark; a nest consists of a depression dug in the pebbles and lined with eelgrass. 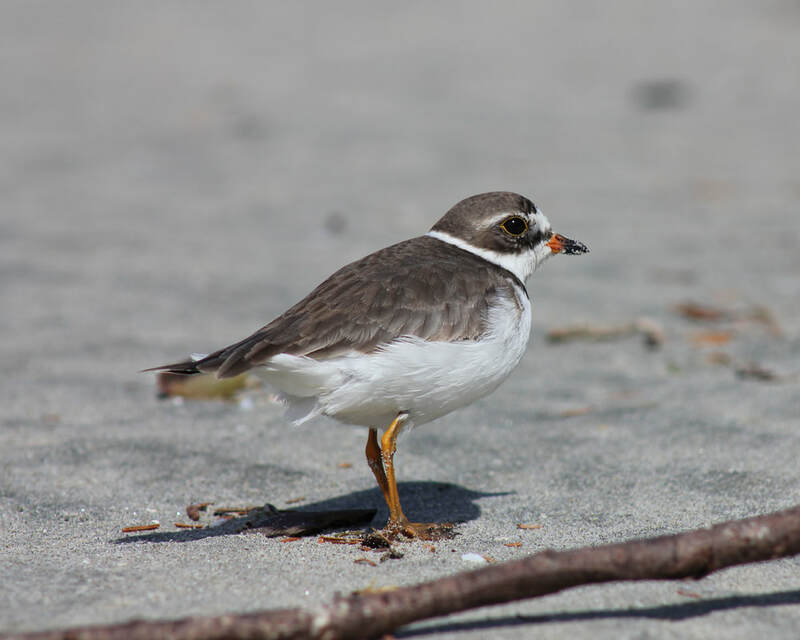 Semipalmated plovers are found on the coast of BC during migration. They spend the summer breeding months in northern Canada and Alaska, and overwinter in coastal areas of southern North America, Central America, and South America. During migration they are seen throughout North America. 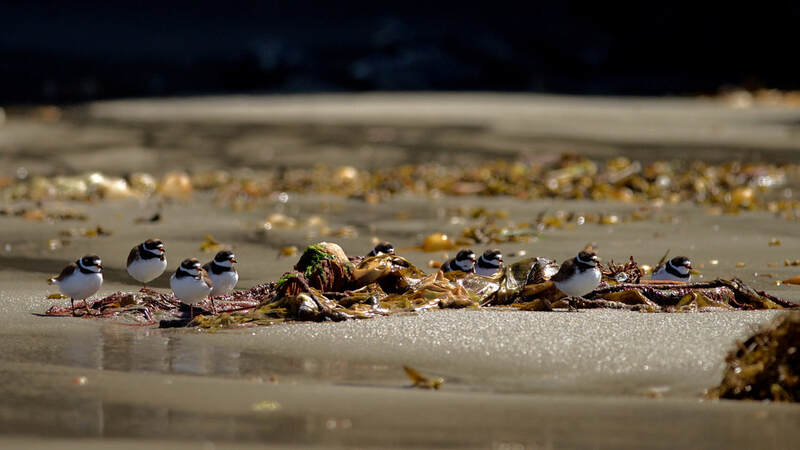 The only similar species found on the BC coast is the killdeer, which is mainly differentiated from the semipalmated plover by its double breast band and size — it can be nearly twice the size of the 18 cm long semipalmated plover. Semipalmated plover adults and chicks can swim short distances. Unlike many other plover species, semipalmated plover numbers are on the rise. Dunn, J. L. and Alderfer, J. (Eds.). (1999). National Geographic Field Guide to the Birds of North America. (3rd Ed.). Washington, D.C.: National Geographic Society. Pp. 154-155. Nova Scotia Communities, Culture, and Heritage. (1998). Semipalmated plover. Birds of Nova Scotia. Nova Scotia Museum of Natural History. Accessed 24/07/2013. Semipalmated plover. The Birds of North America Online (A. Poole, Ed.). Ithaca: Cornell Lab of Ornithology. Retrieved from the Birds of North America Online. Accessed 24/07/2013.